In this sequel to last year's The Year of the Book, Anna, who has learned to make friends beyond the pages of her favorite books is now in fifth grade, and she has a new problem. Her family has just adopted a one-year-old little girl from China named Kaylee, but Kaylee is struggling to thrive in her new environment. Anna is worried each time her new sister returns home with a negative report from the doctor's office about her failure to gain weight. Anna is also having trouble deciding on a topic for an assignment where she has to design and conduct a science experiment. When she and her friends realize that singing helps Kaylee eat her food, they decide to use Kaylee's struggle to gain weight as the focus of their experiment. In the middle of the night I wake up and realize that I forgot to study my spelling and vocabulary words. Last year in fourth grade, they were so easy that I got 100 without studying. But this year there are usually some words I don't know. I turn on the light, rummage in my backpack for my notebook, and flip quickly through the pages. Twelve words this time: hospitality, lively, simile, metaphor, insomnia, delicious, desert, dessert, adapt, superfluous, comprehensive, limerick. I look hard at the words and spell them in my head. Then I close my eyes and try to remember as many as I can. I think of pictures to go with each word, like desert goes with camels and sand. In about ten minutes, I have the words memorized. I turn the light off again and lie still in my bed. I love the way this passage highlights Anna's desire to be a good student and the ease with which she is able to memorize, and also the way the author describes the process of memorization. Kaylee holds on around my legs. “She's look like you,” Laura says. I don't know what to say. The only reason Laura thinks we look alike is because we're both Chinese. Laura's comment seems to originate in ignorance, not in a desire to be hurtful, but I like the way the author gently points out why it makes Anna feel bad. Cheng provides a teachable moment that gives the reader a chance to consider not just how we talk about other people's cultures, but also how we respond to comments that make us uncomfortable. I especially like that this is a small moment in the story, and not the sole focus of the book, because it shows that race and culture are part of our everyday lives and not just something we discuss in stories specifically focused on these issues. 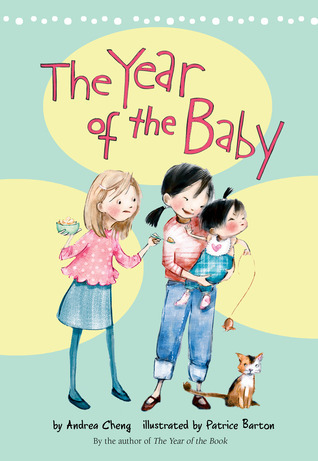 The Year of the Baby is a great follow-up to The Year of the Book, and I'm looking forward to reading the third book, The Year of the Fortune Cookies wherein Anna will take on the new challenges presented by middle school. This series is a logical read-alike for Grace Lin's Year of the Dog, Year of the Rat, and Dumpling Days, which are fictional stories based on Lin's own childhood in a Chinese-American family. It also reminds me of Just Grace and the Terrible Tutu and Just Grace and the Double Surprise, which focus on the adoption of a new child into Grace's best friend Mimi's family. This book also fulfills a great need for more kids' books featuring girls doing science.